The sentence appeared on Chu Ge’s mobile screen. “……” Xiao Yu forced a wry smile. Chu Ge left after questioning Xiao Yu. He just managed to painstakingly finish the mess that Yan Jin left for him. He had no intentions of staying behind to find more trouble to settle. He was busiest around the end of the new year after all. Xiao Yu was carried back to the bed’s headboard by Chu Ge. In the dark room, he stared at the side of Yan Jin’s face for an hour. The sleeping Chairman Yan did not emit his usual oppressive aura. He simply looked like a normal person who happened to look good. Chu Ge’s words echoed in his ears, unable to get out of his thoughts. Xiao Yu knew that Chu Ge did not have any bad intentions. He was asking that question out of worry. That was why it upset him even more. Because he had lied to someone who was sincerely concerned about him. 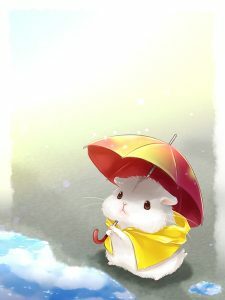 If it was possible, he really hoped that what he told Chu Ge earlier was true; that the lifespan of a hamster demon was longer than a normal hamster. Alas, a pity that it seemed otherwise. This was what people described as “the person in the predicament was baffled while the onlooker saw it clearer”. If it wasn’t for Chu Ge’s reminder, Xiao Yu would not have noticed that his memory was getting worse. He already could not remember things that had happened merely a few days ago. As for what had happened in his previous life, those memories became increasingly blurry. The most obvious sign would be the designer competition that had happened not too long ago. That was the only grand award that he had won in that entire year after getting suppressed by the mystery designer. He competed with a world-renowned designer and became history’s youngest grand winner. It was supposedly something that should be happening soon, yet Xiao Yu absolutely could not recall what idea he had submitted for the competition before. Xiao Yu rubbed his eyes. No wonder he felt that his eyesight was becoming worse these days. He thought that it was because he had played too many games. As a person who was reborn, Xiao Yu was one of the handful of people on this earth who could face death directly. Perhaps among those people, he was the one closest to death. As a person who had died once, Xiao Yu once thought that he would fear death less than others. But he now realized that such thoughts were incorrect. Right now, he feared death more than he had as a human. Back then, he felt that he had nothing to be worried about in this world – he had no lover and no family. He once thought he had friends, but reality had proven him wrong. The person he was back then had nothing to lose as he stood all alone. However, right now, Xiao Yu had met Yan Jin. He met Chu Ge and the little disciple, Nannan, who had a spot in his heart even though they had never met before. He suddenly had so many people that he was concerned about in this world. He really could not bear to leave right now and let go. That he was happy they had met. At ten-thirty in the morning, Yan Jin woke up from his sleep. The first thing he did was grab the little fellow that was staring silly at him on the bed’s headboard and press kisses onto him. It was rare that Xiao Yu did not push Yan Jin away. Instead, he played along to stretch out his paws to hold onto Yan Jin’s lips, as if he was hugging Yan Jin’s mouth. “You’re up early. Why didn’t you wake me up?” Yan Jin asked. “Squeakk.” You’re cuter when you’re asleep. “Squeakkk.” You already sleep a lot. If you sleep any longer, will you turn into a pig? Chu Ge was indeed busy at the end of the year. Yan Jin was aware of what Chu Ge was busy with, which was why when Xiao Yu had suggested to get helpers for his work, the chairman had not agreed immediately. Although the outcome was no different. When it came to choosing between taking advantage of a friend or letting down a pet, the scale in Yan Jin’s heart had never been balanced before. Chu Ge was used to it as well. After the doctor left YL, he took a cab straight to the hospital. The weather was extremely cold, and his car’s heater was not working, making the ride a tough one. Moreover, he had stayed up all night. He did not dare to drive on his own. The ride from YL to the hospital was not a short one. The cab that Chu Ge was in took the longer route, obviously planning to earn more money during this peak hour. Chu Ge simply did not have the energy to be bothered about such matters. He pretended not to notice it and shut his eyes. After staying up for the whole night, he was mentally exhausted to the max. Yet in that one hour plus ride, he had not slept for even one minute. It was the twelfth day that he had insomnia. It was still relatively early when he arrived at the hospital. The elevators in the hospital were particularly troublesome – there were no direct elevators to the top floor, leaving him with no choice but to transfer to another one at the eighth floor. Chu Ge had brought up the issue to the hospital management several times, yet the higher-ups felt that this minor issue had no impact and declined to install a new elevator. After becoming a doctor for so many years, Chu Ge had people who he was familiar with in every department. That was why even if he was not walking in his own department, he could easily meet someone that he knew. “You’re flattering me. From what I see, you look way better. If you get any better, I don’t think those patients would dare to consult you.” Chu Ge said. “Hn, why is that?” The female doctor asked puzzledly. The female doctor paused before she trembled with laughter. The female doctor would turn forty once the year was over. She was still single to date and was considered one of the older doctors in the hospital. She was usually bothered about her age and would put on makeup during working hours. Perhaps, only a person like Chu Ge who changed girlfriends every half a year (?) would notice that accurately. The female doctor laughed as she looked at Chu Ge’s handsome face. It was simply too irresistible. Young, successful at work, and even good at coaxing. *Sighs* How she wished she was ten years younger. At her current age, towards a young man like Chu Ge, the will was there, but not the strength. “Seems like I did a good job checking on my patients last night, otherwise they wouldn’t have recognized me earlier.” She continued with Chu Ge’s conversation. The female doctor was surprised. She was wondering what Chu Ge could had taken out from his pocket. Never did she expect that it would be a concealer. She knew about this brand of concealer. The price almost made her tear up. When the price fell last week, she still couldn’t bear to purchase it. She never expected to see this concealer in such a situation. The female doctor, who was still in shock, did not even hear Chu Ge bid goodbye. Although all the work had been completed, there was no need to head home immediately. YL would commence their holiday right after the shareholders’ meeting tomorrow. “I’ll be on holiday once the meeting tomorrow is over. So let’s stay in the office for one more day, okay?” Yan Jin asked. Xiao Yu, who was still deep in his thoughts, did not reply. Yan Jin’s gaze landed onto Xiao Yu’s iPad. The screen was very dark as the character was still counting down on its revival. “Squeakk.” Sure, I’m okay with it. Xiao Yu ignored Yan Jin’s threat completely as he began controlling his game character after the countdown was up. Yan Jin, who was ignored, could only silently walk back to his chairman seat. Xiao Yu looked up for a moment from his iPad, waved his paw, and turned back immediately. The meaning was crystal clear. “……” Yan Jin, who had already said what he needed to, was left with no choice but to put on his coat and leave his office all alone. Xiao Yu let out a sigh of relief. When his game had ended earlier, he could have gone with Yan Jin. But at this moment, he only wanted to quietly sort out his thoughts alone. Thoughts such as how he should bid farewell to Yan Jin. Like, how was he going to tell Yan Jin that they will be parting ways? Chu Ge said that his girlfriend had made a paper box to bury her hamster. He wondered if Yan Jin would do that. Probably not, paper boxes were too cheap. He was Yan Jin’s pet after all. He was the pet of the Chairman Yan whose net worth was over billions of dollars. A coffin would be the least requirement. Even the tombstone would be gold-plated? Gold-plating would not be enough, it should be pure gold. Perhaps Yan Jin might even imitate Emperor Qin Shihuang¹ and make some clay humans, no, clay hamsters to be buried together with him? Hahaha, he should make a clay Yan Jin to lie beside him so that he would become Yan Jin’s pet again in their next life.